Back in 2009, Lancôme launched Génifique. It took the beauty world by storm and became the brand's iconic product. Now, this year, Lancôme is all ready to make waves again with the new and improved Advanced Génifique! Built upon a foundation of a 14-year long research in gene science and 9 patents covering until 2029, the Advanced Génifique tackles the 10 signs that characterize youthful skin. The new formula contains a biotechnology derived ingredient that allows each drop of the Advanced Génifique to deliver almost 40% more active ingredients than the old Génifique. It sinks into the skin almost instantly to create a cocooning effect, plumping the skin so that it is left feeling full, firm and bouncy. In JUST 7 days. New formula with addition ingredient (Probiotic). Repairs and activates the 10 signs of youth. New enveloping texture; it wraps your skin like a cocoon, absorbs really fast and leaves skin soft as silk. New exclusive and patented self-loading dropper. 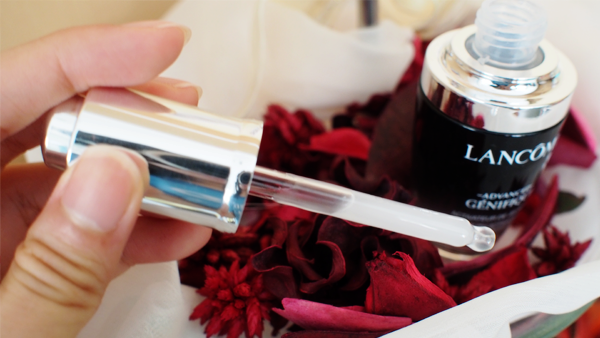 Each drop now contains 40% more active ingredients. Produces 25 times more youth proteins as compared to the old version. I applied the Advanced Génifique after my toner and right before my moisturizer. As it comes with a self-loading dropper (Turn the cap all the way to the end and hear a 'click' sound! ), I dispensed whatever that is loaded and patted the serum onto my skin. It sank into my skin very quickly, prepping my skin for the next step. The serum left my skin feeling very soft and semi-matte. When I applied my moisturizer, my skin seemed to receive it more readily and easily. And because the serum was fully absorbed into my skin, my moisturizer didn't pool around (If the serum isn't fully absorbed, the moisturizer may just be mixed with the serum and kind of just sit on top of your skin.). During the trial period of 3 weeks, I noticed a marked clarity in my complexion. The appearance of my pores were less noticeable and of course, my skin was feeling hydrated and very plump indeed (Advanced Génifique and Stempower clearly make a very powerful duo.). I skipped the serum during the day but my cheeks didn't go dry and my T-zone was noticeably less oily. The only gripe that I have about the serum is that I wish fragrance wasn't added to it. It didn't cause any irritations but I see fragrance as an unnecessary ingredient. 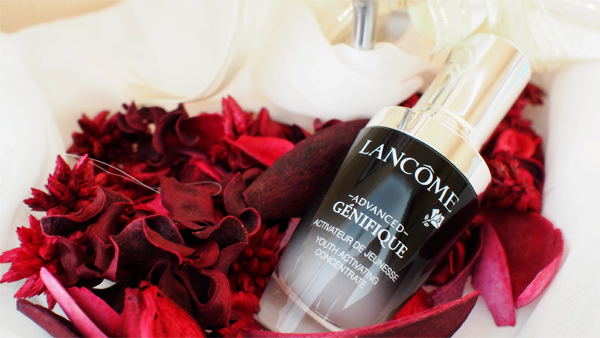 As of May 1st, Lancôme's Advanced Génifique replaced the old Génifique and is available at all Lancôme counters. The brand is running a complimentary islandwide 7-day trial sampling campaign in the months of May and June. I hope this was helpful. Do leave a comment if you have an queries. (: Thanks for reading!